Police Officer Conrad Gary and Police Officer Eduardo Marmolejo were struck and killed by a South Shore Line commuter train while investigating a shots-fired call in the area of 103rd Street and Dauphin Avenue at 6:20 pm. Officer Gary had served with the Chicago Police Department for 18 months and was assigned to the 5th District - Calumet. He is survived by his wife and child. Officer Gary was a U.S Air Force veteran. Petty Officer 1st Class Martin Bill Larsen Jr. enlisted in the U.S. Navy, served as a ships cook and was a veteran of World War II. On August 13, 1944, Petty Officer 1st Class Larsen died at sea in service to his country. 2nd Lt. Joseph F. Ives was killed in a plane crash on 4 Apr 1918 (during WWI) He died during a flight at Ellington Field in Houston, TX. Joseph Ives was born and raised in Chicago, graduated from Phillips HS and lived at 6008 S Prairie. From 1912-1918, he was a motorcycle policeman for the Chicago Police. Corporal Patrick J. Bermingham was born in 1909. He completed two years of high school before becoming a Chicago Police Officer. He worked out of the 007the District Woodlawn Police Station. His late father, also Patrick, was a retired Chicago Policeman. He enlisted in the U.S. Army on April 2, 1942 and attained the rank of Corporal. He was killed on March 28, 1945 when the truck he was driving was sideswiped by another truck while he was driving to Camp Ellis. He was survived by his two brothers, Edward and John T. Birmingham, a Chicago Policeman at the District Deering Street station. Sgt. James W. Griffin was born in 1915 to Municipal Judge John J. Griffin and Alice McCabe. He grew up on the northwest side of Chicago with his four brothers and a sister. He attended Campion Catholic Prep. High School in Prairie du Chien, Wisconsin and upon graduation he completed one year of college before becoming a Chicago Police Officer. He worked his way up to becoming a Detective at the 40th District Summerdale Police Station on the north side. Jim enlisted in the U.S. Army on April 7, 1941 and sent to Fort Knox where he was assigned to Company B, 192nd Battalion and trained to operate all equipment used by the battalion. In October of 1941, the 192nd Tank Battalion was sent to the Philippine Islands and Jim arrived there just a little over two weeks before the Japanese attacked Pearl Harbor. On December 21st, Jim took part in the first action by American tanks in WWII. Jim’s tank took several hits, and his machine gunner was killed. The tanks were lost to enemy fire and the American and Filipino forces were eventually surrendered to the Japanese. Jim took part in the infamous Bataan Death March and survived. He was held as a prisoner in Camp O’Donnell and Cabanatuan Prison Camp where he worked on a farm and did construction work. It is believed that because of illness he was sent to Bilibid Prison outside of Manila where he was eventually shot and killed by a Japanese guard and died on May 20, 1944. Jim’s rank at the time of his death was Sergeant and he was awarded the Purple Heart Medal. He was survived by his parents and four siblings: John A. Griffin, Robert E. Griffin, Lt. Edward E. Griffin and Mrs. Alice Johnson. 1st Lt. John A. McCarthy was the son of Chicago Fire Captain Patrick J. McCarthy and worked as a fireman himself for three and a half years at Engine Company No. 1 at Lomax and Wells. He then joined the Chicago Police Department in January 1939 and was known to have worked out of the Wabash Avenue Station. He enlisted in the U.S. Army on March 5, 1940 and gained the rank of Lieutenant. He was killed in action in France on September 13, 1944. He was 30 years old. Lt. McCarthy was survived by his parents, his widow, Josephine, a son, John Jr. (11 mos. ), two brothers, CPD Patrolman William McCarthy of the traffic detail, and Petty Officer 2nd Class Raymond McCarthy of the Coast Guard, and by two sisters, Frances McCarthy and Mrs. Hugh Kelly. Patrolman Edward F. Carney, Star #83, aged 29 years, was a 1 year, 5 month, 6 day veteran of the Chicago Police Department, assigned to the Central Station. On November 30, 1893, Detective Carney and his partner, Detective John Conway were under orders to stop and question any pedestrian found in a residential area in the late hours of the night. Police were on alert due to a recent series of crimes in the area. While walking in the residential area, the detectives observed A. F. Holmes and James G. Potter, at 39th Street and Langley Avenue. The detectives stopped the men and attempted to question them. Taking offense to being stopped, the men became confrontational. This led the detective to placing the men under arrest. As they were being placed into custody, both men drew large Colt revolvers. One bandit struck Detective Conway over the head and the other shot Detective Carney. Detective Carney sustained a gunshot wound to his lower right leg, the bullet lodging in his knee. The men then made good their escape. After the shooting, Detective Carney was taken to his brother’s residence located at No. 2931 Union Avenue (present day 2931 South Union Avenue). Doctors were called and decided against extracting the bullet, believing it would do more harm than good. Detective Carney lingered there for seven days, his wound becoming infected with blood poisoning. On December 8, 1893, he was taken to Chicago Hospital located at 15th Street and Champlain Avenue where he underwent emergency surgery. He developed complications during surgery and died at 7:00 p.m. on December 8, 1893. Holmes and Potter were arrested a short time after the incident and taken to the 35th Street Station. During questioning the men identified themselves as Private Investigators for the Thiel Detective Agency. Following questioning the men were released from custody. After the death of Detective Carney, warrants for Holmes and Potter were issued and they were rearrested. Holmes was charged with murder and Potter with accessory. The men were then held by the Criminal Court and bond set. Detective Carney was waked at his residence located at No. 2931 Union Avenue (present day 2931 South Union Avenue), his funeral mass was held in Requiem at All Saints’ Church and he was laid to rest on December 12, 1893 in Calvary Cemetery, 301 Chicago Avenue, Evanston, Illinois. Detective Edward F. Carney, born in 1863, received his Probationary Appointment to the Chicago Police Department on July 2, 1892. Detective Carney was survived by his wife, Maggie; parents: John and Johanna and siblings: John (CPD) and Mrs. A. E. Sachse. Incident Recorded under Chicago Police Department homicide file, Case #2813. Note: The "Central Station" is not to be confused with "District 1, 1st Precinct - Central" as these were separate and distinct units at the time. Patrolman William Hallaran was shot and killed by a suspect he had previously arrested. In 1882 Patrolman Hallaran arrested the suspect for burglary. His testimony at the trial helped convict the suspect and send him to prison. The suspect was sentenced to four years for the burglary. When he was released from prison, the suspect tracked down Patrolman Hallaran and shot and killed him. The suspect was arrested and convicted of murder. He was sentenced to 35 years hard labor in the Joliet Prison. A year later the suspect escaped and remained at large for 34 years. He was returned to prison in January of 1923 after he had been arrested for assault with intent to kill the previous July. The suspect died in November 1933. Officer Hastings heard a shot fired and went to investigate while patrolling Navy Pier on August 14, 1933. He came upon five gunmen in progress of a robbery. The business being robbed was the office of the Bureau of Streets. During that time, the Illinois Emergency Relief Commission was using the office to issue welfare payments to citizens stricken by the Great Depression. One of the offenders shot at Jerome Hartnett, one of the Bureau Clerks, when he attempted to call for help and the offender missed his head by an inch. This was the shot that caused Hastings to appear on the scene. While aiming his weapon at one of the bandits, another gunman fatally fired at Officer Hastings. He fell wounded and managed to fire back twice. The fire on Officer Hastings passed through his heart and exited his back. He was waked at the home of his brother-in-law, John J. O’Hara and buried at Mount Olivet Cemetery. On August 23, 1933, Morris Cohen was sentenced to death for his part in the slaying of Officer Hastings. Cohen was executed in the electric chair on October 13, 1933 at Cook County Jail. Patrolman Thomas F. Murtha was killed when he was struck by an automobile at the north entrance to the Halsted Street Bridge. The driver of the vehicle, John T. Yagen, was drunk while operating the vehicle. Yagen was later acquitted by Judge Fisher. While patrolling a Northside alley, Patrolman James Keon fell into an excavation hole on November 20, 1878. He suffered fatal injuries from the incident and succumbed to his injuries in his home on December 1, 1878. P.O. Hamp T. McMikel Jr.
Name: Hamp T. McMikel Jr. While off-duty, Sergeant Hamp T. McMikel Jr. was shot and killed during an armed robbery at 4135 S. Lake Shore Drive. Sergeant McMikel was ambushed by a gang of gunmen while using a pay phone around 8:20 P.M. on November 20, 1982. Sergeant McMikel announced he was a police officer and drew his .38 revolver. Shots were exchanged and Sergeant McMikel fell to the ground. A passing motorist saw McMikel slumped beneath the phone and notified police. Sergeant McMikel was transported to Michael Reese Hospital where he succumbed to his wounds in the emergency room at 10:00 P.M. He was buried in Holy Sepulchre Cemetery. Sergeant McMikel was a 32-year-veteran of the Chicago Police Department. Ray Greer, one of the gunmen, confessed to Sergeant McMikel’s murder and was sentenced to life in prison. P.O. Edward L. Simanek Sr.
Name: Edward L. Simanek Sr.
On June 4, 1968, Police Officer Edward L. Simanek Sr. and his partner, Police Officer Stankowicz, pulled over a vehicle for a traffic violation. This vehicle contained two occupants. The driver of the stopped vehicle got out at which time the passenger, Robert Jones, produced a handgun and shot Officer Simanek in the face. As Officer Simanek lay on the street, Jones shot him again, striking him in the buttocks. Jones fled on foot and was subsequently shot and taken into custody by Officer Stankowicz. Officer Simanek, critically wounded, was removed to the Illinois Research Hospital. He had suffered severe facial injuries and a severed nerve leading to his tongue, which caused a marked speech impediment. A tracheotomy was performed. Officer Simanek remained in the hospital for more than five months. Following his initial hospitalization, Officer Simanek would be in and out of hospitals for the next five years. He was fully paralyzed on his left side and only after years of rehabilitations did Officer Simanek regain partial use of his left leg. Despite countless surgeries on his left arm, doctors were unable to give Officer Simanek any use of the limb. Robert Jones was subsequently charged and convicted of Attempted Murder against Police Officer Edward Simanek and sentenced to 25-75 years in the Illinois Department of Corrections. Tagged: P-O- Edward L. Simanek Sr.
On August 17, 1918, US Army Private Frank Hourihan, of Company C of the 311th Supply Train, was killed when the truck he was driving turned “turtle.” This one-vehicle accident occurred near Blaine, Ohio. Prior to joining the army, PPO Hourihane was the private chauffeur of Chief of Detectives James Mooney. Probationary Patrolman Frank P. Hourihan was a seven-month veteran of the Chicago Police Department. He was on military furlough from the department at the time of his death. On February 13, 2018, a 1st District tactical team observed a suspicious subject, Shomari Legghette, at State Street and Lower Wacker Drive. In response to a shooting at 35 East Lower Wacker Drive the week prior, officers were saturating the area to combat drug sales, which sparked the shooting. The officers attempted to make contact with Legghette for a field interview when he fled on foot. A foot pursuit followed and a description of Legghette was broadcast over Zone 4 radio. The pursuing officers lost sight of Legghette at Lake and State Streets and relayed the message over the radio. One of the pursuing officers cautioned responding units to not get hurt, the offender was only wanted for a field interview. Commander Bauer had just attended a training session within the vicinity of the Thompson Center and minutes before he was due to head to a meeting at City Hall he monitored the radio call. The Commander spotted a man matching the description of the suspect at 161 North Clark Street and gave chase across Clark Street into the Thompson Center Plaza located at 100 West Randolph Street. Commander Bauer confronted Legghette in the plaza near the top of the Food Court’s East emergency exit stairs. A struggle ensued and Legghette pulled the Commander down the stairs. Shortly after the fall Legghette produced a semi-automatic handgun with a thirty round magazine. Legghette stood over the Commander and fired seven rounds. The Commander was struck six times in the head, neck, torso, back and wrist. Legghette then attempted to make good his escape, but was arrested at the top of the staircase by responding officers. Due to the commotion, it wasn’t immediately known that the Commander was shot. An officer inspecting the staircase found him a few minutes later. His body was lying just out of sight from the top of the staircase, his weapon still holstered, and his radio and handcuffs lying next to his body. An ambulance was summoned and Commander Bauer was transported to Northwestern Memorial Hospital where he was pronounced dead. Shortly after the arrest of Legghette he was found to have been wearing a bullet proof vest and was transported to Area Central Headquarters for further investigation. Legghette was charged with First Degree Murder, Possession of Less Than 15 Grams Heroin and Possession of a Firearm by Felon. Commander Bauer was waked at Nativity of Our Lord Church located at 653 West 37th Street, his funeral mass was also held at Nativity of Our Lord Church and he was laid to rest on February 17, 2018 in Holy Sepulchre Cemetery. 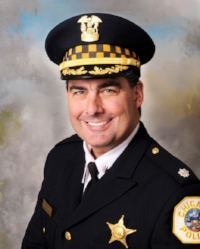 Commander Bauer had served with the Chicago Police Department for 32 years and served as commander of the 018th District. He is survived by his wife, Erin, and daughter, Grace.